For 2 servings like the one you see in the ramekin below, I used 1 cup of whole milk, 2 tablespoons sugar, 2 egg yolks, 2 ounces of 60% dark chocolate, a generous teaspoon of amaretto, and 1/2 teaspoon of vanilla extract. I'm always concerned with getting dark chocolate to fully melt into milk. Short of blitzing the mixture in a blender (which you particularly do not want to do here since you don't want a ton of air bubbles on the surface), you basically just need to be patient and take a few extra minutes to gently whisk the chocolate into the milk to get it as fully incorporated as possible. I bake the custard in a water bath, at 300 degrees, for about 35 minutes, until they are set and barely jiggle when moved. For the caramelized topping here, I used about 2 teaspoons of sugar. The amount of sugar topping is relatively discretionary. When I use wider crème brûlée dishes, I go with a tablespoon of sugar but for these regular round ramekins, I found 2 teaspoons to be sufficient enough to give you a generous layer of that crackly sugar topping. These are full of dark chocolate flavor, with a background note of delicious amaretto - possibly my favorite liqueur. I could totally eat the custard plain but that caramelized sugar sugar crust contrasts beautifully with it to give us texture. The richness of chocolate allows us to use milk and omit the cream in this recipe, and I enjoyed how the dark chocolate custard was lighter tasting and feeling because of it. We recently went out for brunch where dessert was a beautiful array of mini treats. We tasted a bit of (nearly) everything. When it came to the mini crème brûlée, the vanilla custard was so thick, the texture was very close to butter. That was an extreme case but to me, there can be such a thing as too much richness and my body seems to have a lower threshold for it the older I get. Preheat oven to 300 degrees. Bring a kettle of water to a boil and set aside. Place two 6-ounce ramekins into a baking dish. In a small saucepan, bring milk, sugar, and salt to a near boil. Add chocolate and gently whisk in until chocolate melts. It may take a few minutes to fully melt the chocolate. In a mixing bowl, whisk egg yolks until thick and pale yellow in color. Temper the yolks by gradually streaming a bit of the hot milk mixture into it while whisking constantly. Whisk in the remaining hot liquid and then sieve mixture through a fine mesh strainer into a measuring cup or mixing bowl. Gently whisk in the amaretto and vanilla extract. Divide mixture between the ramekins. Carefully pour hot water into the baking dish so that it comes about halfway up the sides of the ramekins. Bake for approximately 30-35 minutes, until custard is set and barely jiggles when moved. Remove ramekins from the water bath, let cool, then cover with plastic wrap and chill in the refrigerator for at least 2-3 hours until firm. Right before serving, sprinkle each ramekin evenly with about 2 teaspoons of sugar. Use a kitchen blow torch and very carefully caramelize the sugar. You should have a layer of dark golden brown caramel. Let sit for 2 minutes before serving so the caramelized sugar can harden into a thin crispy layer that shatters under your spoon. Garnish with a sprinkle of chopped pistachios or almonds, if desired. I have never had a chocolate creme brulee!! This looks absolutely fantastic! I especially love that you added the pistachios (the color alone!!) Hope you had a wonderful weekend! This looks amazing! I have never had a chocolate creme brulee. You are so creative and I am so happy that this has turned out so awesome. I got a kitchen blow torch for Christmas too! This looks delicious!! Your sugar top looks like the perfect thickness for a wonderful crunch with each creamy bite! Love chocolate, anytime, anywhere. The pistachios were a great addition too. I need a good dessert and lightened up sounds terrific! Thanks, Tricia! It looks so dark and decadent but (I know it might sound crazy) it actually doesn't taste heavy at all. Using milk in the custard is totally enough richness for me here. This looks phenomenal, Monica! I am usually not the chocolate dessert person in our family but I am seriously craving for a batch of this creme brulee. 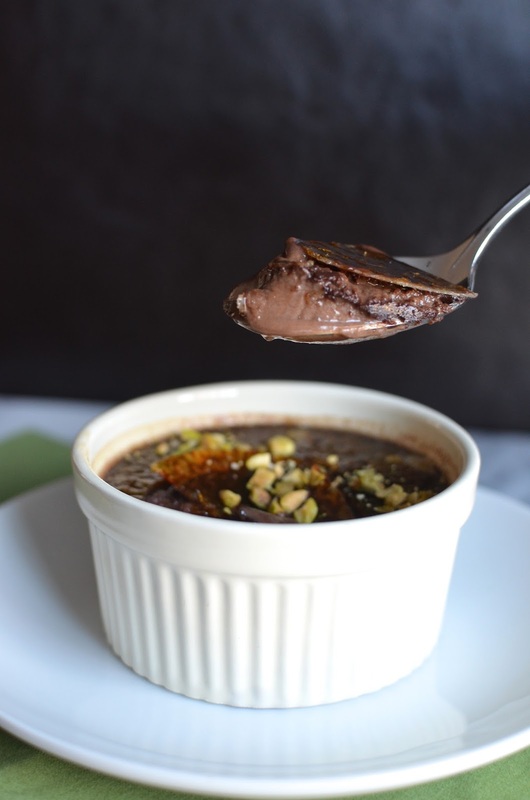 I have never tried a chocolate creme brulee before and it sounds amazing! I love the amaretto and pistachios in here too! This is absolutely out of the world amazing. I love creme brulee, the crunch topping everything is perfect. You also added amaretto, omg. You do come up some of the best desserts ever. Simply damn delicious and fancy creme brulee!!! This looks yummy Monica, I love the dark chocolate and liqueur combination. I am currently on a creme brulee kick...so far I've only tried my hand at vanilla-y versions, but I'm thinking chocolate HAS to happen. This sounds amazing! I find myself on a similar kick, Joanne. I am constantly thinking a creme brulee is perfect for dessert. Wow, this dessert looks absolutely heavenly! Perfect for my chocolate addiction. Ooooh gosh, I LOVE idea of a chocolate version of creme brulee. Now I kind of wish I had a flame torch of my own to play with, so I can make beautiful creme brulees like you ;) The pistachio topping is also too perfect! I love, love, love creme brûlée and creating a chocolate version is making me swoon over this dessert. Every good chef needs a good torch!!! Have a super day. Sharing of course! I'm no chef but I'm happy I got that torch in my arsenal now. ; ) Thanks, BAM. Do you have a Playing with flour Pinterest account? Thanks for asking...but no, my official "playing with flour" antics are pretty much relegated to this little space (for now). A chocolate creme brulee? So awesome! and love that you used dark chocolate. Thanks, Ashley. Chocolate creme brulee is a great thing! Lucky you! I want a little torch, but have yet to get one. This creme brûlée looks delicious! haha - sounds good to me! Marie!! So nice to hear from you - I need a post from you soon, my friend! Seriously!! I must confess that I'm not a fan of creme brulee- but only because I don't like the "brulee" on top! I love what's underneath. And this looks like a deliciously decadent chocolate pudding! !